Alas, this totally awesome feature from LinkedIn API will discontinue its availability sometime in May of 2015. My hopes are that LinkedIn either changes its mind or allows a partner to still continue lending the data to aspiring analysts (such as myself). Regardless, I wanted to take a moment and share a little bit about my experience with some extraordinarily powerful tools explaining network data using the soon-to-be-discontinued LinkedIn API. Before I begin, I need to give the majority of the credit for this experience to the author of this post on Linkurio. The author goes by the pseudonym, Jean, and that’s all I’m able to find out. Thank you, Jean, whoever you are! Also, thanks to Thomas Cabrol for compiling some excellent code as a place to start. Created by Thomas Cabrol on 2012-12-03. Copyright (c) 2012 dataiku. All rights reserved. This code will connect to my LinkedIn account and DOWNLOAD my ENTIRE 1st and 2nd degree network! Spooky, but awesome. Created by Thomas Cabrol on 2012-12-04. The next part of the Python code uses a library called NetworkX to create a file format called graphml which can be imported by a network graphing tool called Gephi. NetworkX is actually capable of far more than simply converting API files to graphml, but we’ll hold off on that tangent for another post. For now, we’ll focus on Gephi and graphml. Ok, so now we’ve got our graphml file. The next step is to import it into this tool called Gephi. You’ll need to download Gephi as an executable — it’s not a Python library or anything like that. It is a standalone visualization tool. I’m a Windows user and I had problems getting Gephi to install properly. I was able to work around this by UNINSTALLING Java, and then reinstalling an old version of Java, version 7. After I did this, I was able to install Gephi without problems. I’m told that Mac users are able to install Gephi with no problems. Figures, ha! On the left-hand-side, ran “Force Atlas 2.” It takes a LONG time for the process to complete, so I cancelled it after about 10 minutes because the visualization was close enough for my needs. I’m left with a stunning graph of my network with me listed as the center node. Each color represents a certain cluster within my list of connections. If you look closely, you can see that some nodes have names next to them (I’ve purposefully left them obscenely small to protect the identities of my connections), but Gephi allows the analyst to zoom in and out in order to explore the network. After only a couple minutes, it becomes blatantly clear which each of these clusters and colors represent. They’re a representation of ME and MY LIFE! The incredibly beautiful part of this entire process was that the analysis was entirely undirected! I had nothing to do with direction the creation of these clusters…NetworkX and Gephi did all of that for me by themselves! To call attention to each of these clusters, I’ve gone ahead and named each cluster, here. Each cluster represents a key time and network (aka: clique) in my life. The Undergrad section represents all of my connections from my undergrad school, Luther College in Decorah, IA. MSPA represents grad school connections (in another state, and 10 years after undergrad, so not much connection between those two networks!) as part of Northwestern University in Evanston, IL. Also interesting, Best Buy had some hard years back in 2008-2010 and a lot of folks left Best Buy to join SUPERVALU, which explains the many connections between the two. The fascinating thing about this analysis, is that through LinkedIn, I have a basic map of my Personal AND Professional life. While this particular map may not be extraordinarily useful for advancing my career, it allows me to be reflective on the state of my network, and in essence, a brief story of my life. 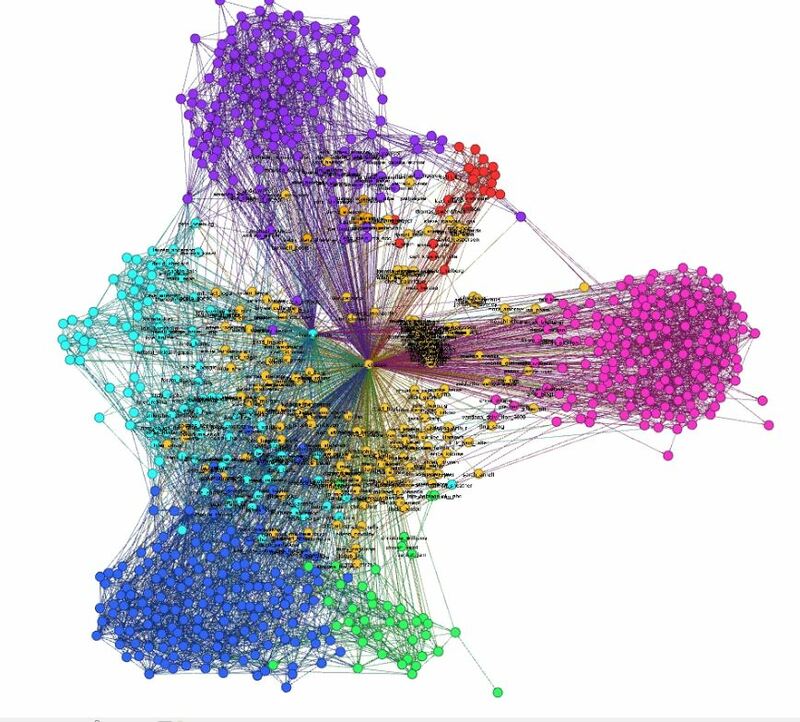 In a business setting, however, I can see how this process might be interesting in identifying clusters, tribes, and influencers using relationship data to understand influence of products, lifestyles, and consumer choices..